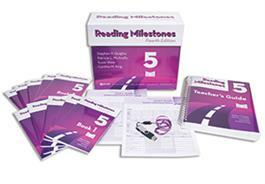 Reading Milestones is the most popular reading program of its kind. This successful alternative, language-controlled program is designed to take readers to approximately a fifth grade reading level. It is especially effective for students with hearing impairments and language delays and is also widely used with others who have special language and reading needs, including individuals with learning disabilities, developmental disabilities, and English Language Learners (ELL). These students are aided by reading materials designed to match their language levels and which progress in steps small enough to ensure continued success in reading. Success from the beginning of the learning-to-read experience motivates students to read and to continue learning. Reading Milestones accommodates the needs of such learners and has been developed to maximize their opportunities for success. The National Reading Panel Components This 4th edition of Reading Milestones includes instructional and reinforcement tasks that focus on developing phonemic awareness and phonics in a language context in the Workbook activities, the Spelling program, and the TeacherÃ¢â‚¬â„¢s Guide. The NRP reported that repeated oral reading with feedback and guidance and well-developed word recognition skills lead to improvements in reading fluency. Repeated reading, although not necessarily oral, is a part of almost every lesson plan in the TeacherÃ¢â‚¬â„¢s Guide. Extensive work on developing automaticity of vocabulary and sight words is presented in the Reading Milestones materials to develop fluency. Extensive work on the development of vocabulary concepts is part of every reading unit. Experiential activities and schema-based strategies are strongly recommended for the development of concepts in young beginning readers. Text comprehension receives major emphasis in the Reading Milestones program with activities reinforcing research-based comprehension strategies such as prediction, questionÃ¢â‚¬â€œanswer relationships, monitoring, and summarizing. Methodology Many students with hearing impairments and other special language needs experience a significant gap between their language base and the materials they are given to read. Reading Milestones was designed and constructed to minimize this gap by beginning with the simplest possible language to ensure initial success in reading and by increasing language acquisition (vocabulary, syntax, figurative language). Students work in very small steps, accompanied by constant reinforcement, to ensure continuing success. Vocabulary, language structures, and comprehension skills are introduced in small and constantly reinforced increments. The vocabulary was drawn from several high frequency word lists (including the Dolch Basic Sight Word List). All the essential comprehension skills-literal, inferential, evaluative, and critical reading skills-are introduced and practiced in the Workbook Activities. Chunking (the separation of phrases by several spaces) is used in the first three levels to aid in processing units larger than single words. Reading Milestones begins at the most basic language level. The program introduces vocabulary, syntax, and idiomatic language in very small steps and reinforces this learning before introducing new materials. The instructional design used in Reading Milestones provides educators with sufficient information to make the reading series a self-contained program. Detailed, step-by-step instructions for teaching each story are provided in an easy-to-use format. Reading Milestones Placement and Monitoring (RMPM) Ã¢â‚¬â€ Separately available, this informal test places students in the correct level of Reading Milestones and monitors their progress through the program. New Look Ã¢â‚¬â€ Many new illustrations have been added to the stories included in the Readers for all levels. TeacherÃ¢â‚¬â„¢s Guide Ã¢â‚¬â€ The TeacherÃ¢â‚¬â„¢s Guide has been revised to include extensive information on recent research and best practices in reading. Strategies for teaching have been expanded and reformatted for clarity. Several useful appendixes have been added. Additional Stories Ã¢â‚¬â€ Many new stories have been included with increased multicultural representation and full-color illustrations. The number of stories in each Reader was increased for a total of 6 stories per book and 60 stories for each level. Story Structure Ã¢â‚¬â€ Many stories were rewritten to include more definite story structure. Knowledge of story structure helps students focus on the components and aids in comprehension. Story Page Layout Ã¢â‚¬â€ All sentences are complete on one page or on opposing pages to aid the student in developing fluency. Workbook Activities Ã¢â‚¬â€ All workbook activities are now provided as reproducible worksheets that can be printed from the Reading Milestones Reproducible Materials Flash Drive, included in the kit. A boxed, printed version of black line masters is also available separately. Spelling Ã¢â‚¬â€ The Spelling program has been improved to develop phonological awareness skills, soundÃ¢â‚¬â€œspelling correspondence, provide additional practice in word recognition to attain automaticity, and improve accuracy in word spelling that will contribute to writing fluency. All Spelling activities are now provided as reproducible worksheets that can be printed from the Reading Milestones Reproducible Materials Flash Drive, included in the kit. A boxed, printed version of black line masters is also available separately. Student Achievement Record (SAR) Ã¢â‚¬â€ used to record the studentÃ¢â‚¬â„¢s completion of each of the stories and activities in the workbook and spelling materials across a level of the program. Space is provided for comments regarding progress and recommendations. A package of 10 SARs is included in the kit. Word Cards Ã¢â‚¬â€ Vocabulary words taught in the program are displayed in two formats: as reproducible PDFs on the Reading Milestones Reproducible Materials Flash Drive and as boxed, printed cards available separately. The cards are grouped and alphabetized by corresponding reader and numbered accordingly. Students can use the cards for practice in the Spelling and other lesson activities, in group games, and as flash cards in individual or group review. Reading Milestones Reproducible Materials Flash Drive Ã¢â‚¬â€ Included in each kit, now reproducible PDFs are available for all Workbook Activities, Spelling and Word Cards. Included in the Package: TeacherÃ¢â‚¬â„¢s Guide; a boxed set of 10 Readers; Reproducible Materials Flash Drive containing reproducible PDFs of Workbook activities, Spelling, and Word Cards; and a 10-pack of Student Achievement Records, all in a sturdy storage box.